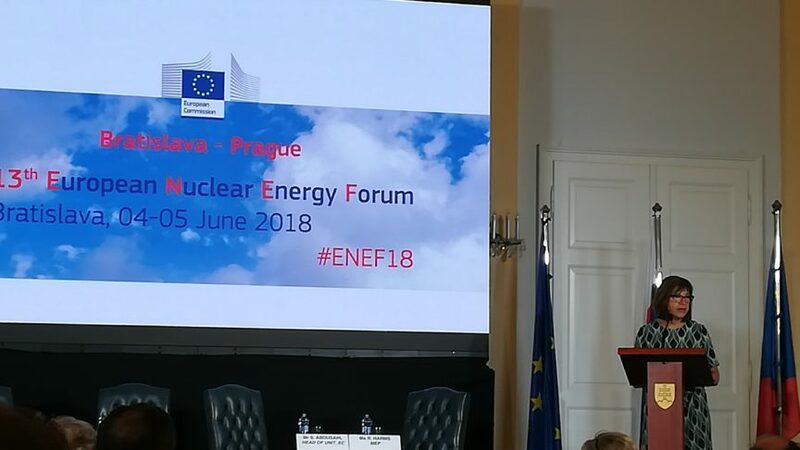 The 13th European Nuclear Energy Forum (ENEF) organised by the European Commission with two hosting countries (Slovakia and Czech Republic) took place in Bratislava on 04-05/06. This event, which received the mandate from the European Council to be to be a “platform for broad discussion of the opportunities and risks of nuclear energy”, focused this year on the topics ‘Maintaining a critical level of nuclear safety expertise in Europe’ and ‘Small Modular Reactors’. Members from Nuclear Transparency Watch evaluated this year’s ENEF critically. We will keep you informed about our evaluation of the event, but would like to give already access to the presentations from civil society representatives. Rebecca Harms, MEP Greens/EFA and Vice-Chair of NTW made an opening speech on the first panel where she emphasised the importance to focus on radioactive waste and decommissionning rather than new build. To watch her full presentation, see the Webstream of Day 2. (min 13’34”). Dr David Lowry, independant researcher at Nuclear Waste Advisory Associates and member of NTW made a presentation on the second panel regarding the “Inconvenient Truths of Small Modular Reactors.” Download here his full paper. Download the full ENEF2018 programme.